A manufacturer was deburring the oil bores on these crankshafts by hand for a large automotive customer. After repeated complaints from the customer, the manufacturer set out to look for a more reliable process for producing higher quality parts. HEULE determined that the application was suitable for the newly-innovated COFA-X, currently the only automated solution available on the market for deburring 1:1 ratio cross bores. 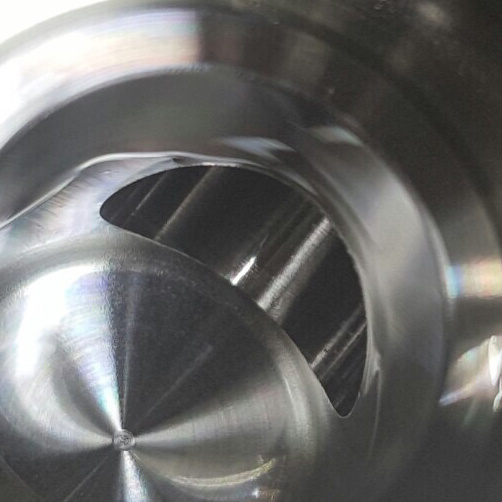 A hydraulics manufacturer was able to reduce production costs and eliminate manual deburring using HEULE's X-Bores technology to deburr complex cross bores. A manufacturer of hydraulic components and fittings was looking for a more efficient and safer deburring solution for the cross hole of a ball valve. The goal was to automate the process and eliminate the tedious and time-consuming work of removing the burrs of the bore edge by hand with a brush.